Washington is a state located in the Western United States. As of the 2010 U.S. census, Washington is the 13th most populous state, with 6,724,543 inhabitants, and the 20th largest by land area, spanning 66,455.52 square miles (172,119.0 km2) of land. Washington is divided into 39 counties and contains 281 incorporated municipalities that are divided into cities and towns. Legally, a city in Washington can be described primarily by its class. There are five classes of municipalities in Washington: first class city, second class city, town, unclassified city, and code city. First class cities are the 10 cities with a population over 10,000 at the time of reorganization and operating under a home rule charter. They are permitted to perform any function specifically granted them by Title 35 RCW (Revised Code of Washington). Second class cities are the 9 cities with a population over 1,500 at the time of reorganization and operating without a home rule charter. Like first class cities, they are permitted to perform any function specifically granted them by Title 35 RCW. Towns are the 69 municipalities with a population of under 1,500 at the time of reorganization. Towns are not authorized to operate under a charter. Like the previously listed cities, they are permitted to perform any function specifically granted them by Title 35 RCW. In 1994, the legislature made 1,500 the minimum population required to incorporate. Unclassified cities are cities that are not operating under any other class. 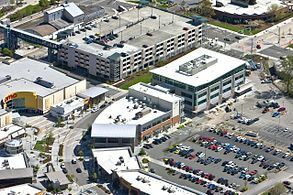 Only one city—Waitsburg, in Walla Walla County—is unclassified. It operates under the 1881 territorial charter under which it was organized, eight years before Washington was admitted to the Union in 1889. Code cities were created by the state legislature in order to grant the greatest degree of local control to municipalities possible under the state constitution and general law. This classification has been adopted by 192 municipalities in Washington. Code cities (shorthand for optional municipal code cities, as encoded by Title 35A RCW) are authorized to perform any function not specifically denied them in the state constitution or by state law. They may perform any function granted to any other city classification under Title 35 RCW. A city in Washington can be described by its form of government. Cities and towns are specifically authorized three forms of government: Commission, Mayor-Council, Council-Manager. The last city to use the three-member commission form of government was Shelton. In a 2017 Proposition, the residents voted to adopt the council-manager structure. Most cities in Washington have the Mayor-Council form of government, which calls for an elected mayor and an elected city council. Cities with Council-Manager system have an elected council and appointed city manager. In addition, if the population of code cites is over 10,000, they may incorporate as charter code cities. They may then "set out any plan of government deemed 'suitable for the good government of the city'" (RCW 35A.08.050), which need not be a commission, mayor-council, or council-manager form. No charter code city has opted for a different type of government as of 2012[update]. 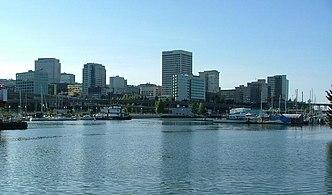 The largest municipality by population in Washington is Seattle with 608,660 residents, and the smallest municipality by population is Krupp with 48 residents. 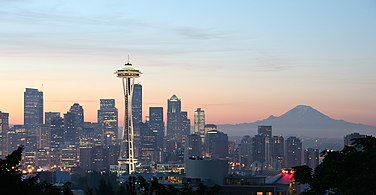 The largest municipality by land area is Seattle, which spans 83.84 sq mi (217.1 km2), while Beaux Arts Village is the smallest at 0.08 sq mi (0.21 km2). ^ a b c d e f g The city spans multiple counties. The counties are listed in the order given by GNIS, primary county first. ^ a b c "GCT-PH1 – Population, Housing Units, Area, and Density: 2010 – State — Place and (in selected states) County Subdivision". 2010 United States Census. United States Census Bureau. Retrieved June 17, 2016. ^ "Washington: 2010 Population and Housing Unit Counts 2010 Census of Population and Housing" (PDF). 2010 United States Census. United States Census Bureau. September 2012. p. III-2. Retrieved August 3, 2016. 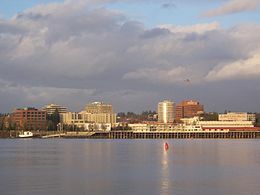 ^ "Washington City and Town Profiles". Municipal Research and Services Center. Retrieved May 11, 2016. ^ a b "Domestic and Antarctic Names - State and Topical Gazetteer Download Files: National Federal Codes" (CSV). United States Board on Geographical Names, USGS. Retrieved November 25, 2012. ^ a b c d "US Gazetteer files: 2010, 2000, and 1990". United States Census Bureau. 2011-02-12. Retrieved 2011-04-23. ^ "Annual Estimates of the Resident Population for Incorporated Places: April 1, 2010 to July 1, 2014". census.gov. May 21, 2015. Retrieved May 28, 2015. ^ "Annual Estimates of the Resident Population for Incorporated Places: April 1, 2010 to July 1, 2013". census.gov. May 2014. Archived from the original on May 22, 2014. Retrieved May 23, 2014. "Washington City and Town Profiles". Municipal Research and Services Center of Washington. Retrieved November 25, 2012. Up-to-date table of Washington municipalities. "Cities and Towns of the United States" (DBF). National Atlas. United States Department of the Interior. 2012. Retrieved July 15, 2013. Database of places noting county seats. This page was last edited on 4 March 2019, at 00:54 (UTC).